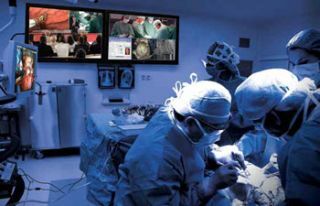 Streaming video offers residents, fellows, and clinicians in training the option to witness procedures remotely instead of crowding into already busy operating theaters. As streaming video grows increasingly prevalent as a training and communications tool, the healthcare market’s adoption of this technology is on the rise. Not only are hospitals utilizing video as a means of connecting medical professionals, it’s proving to be practical for patient education as well. A recent mandate requiring teaching hospitals to be equipped with simulation labs also presents opportunities for integrators. “These facilities recreate an operating room environment or a procedure room environment, and students participate in mock procedures,” Pfeuffer explained. Overhead cameras and microphones record the simulation, and systems such as Haivision’s video over IP solution are used for encoding, decoding, recording, and playback. South Western Communications, a systems integration firm based in Nashville, TN , is currently updating a trauma room system for a local teaching hospital. The system features an AV recording system integrated with VBrick video streaming technologies, enabling the trauma room staff to record procedures at the push of a button. “That video and audio is then streamed to a server that is recording all of these different sessions, and they utilize that video for teaching purposes,” explained Tony Hackett, senior account manager. When it comes to incorporating technologies such as streaming, videoconferencing, and IPTV into healthcare facilities, it’s necessary for AV integrators to speak the IT professional’s language.